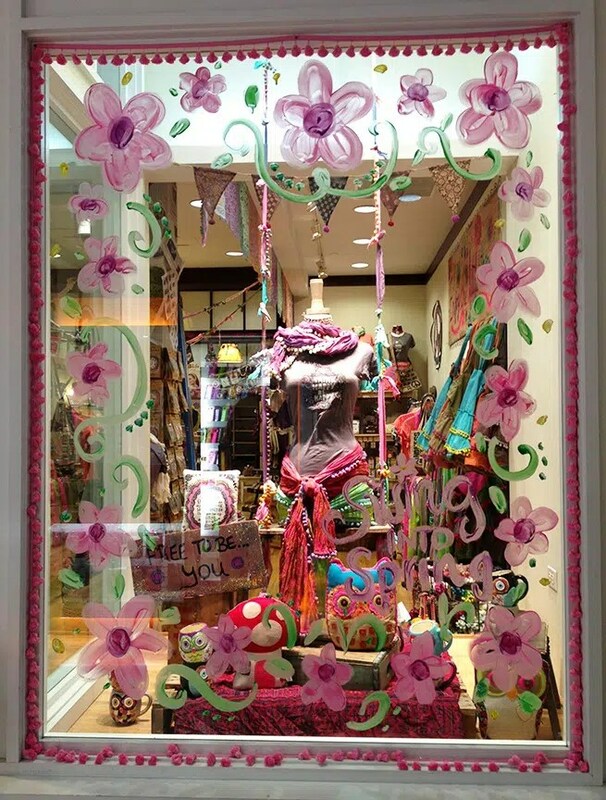 Your shop window displays will likely be the first interaction your customer has with your brand. It’s a make or break moment – you have a split second to convince them to stop, look for longer, and make the decision to come into your store. So, how can you use window dressing to boost the impact your store has on the high street? Can customers see past your window displays? 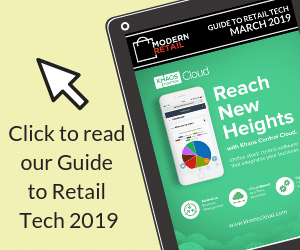 In the past, window displays tended to barricade a shop window with shelving or backing, but the trend is now for displays to be open to the shop behind them so that customers can see inside. Psychologically, a customer who doesn’t know your store is more likely to come inside if they can see what to expect in advance. Displays at waist height or with strategic gaps can achieve this while still leaving scope for product display. This fashion retailer’s display uses designs applied directly to the window to give a block colour effect to match the product, while still revealing the shop interior. Well-known destination stores can get away with not explicitly using product in their window – fashion brand Anthropologie is famous for its creative window displays, which often don’t feature clothes or mannequins at all. But if you’re a smaller independent, you need to signal to that person on the pavement who doesn’t know your store what they can expect when they come inside – and why they would want to. 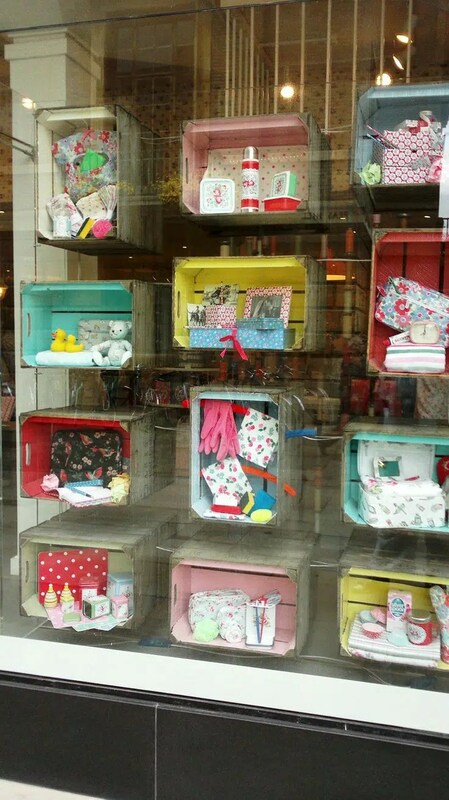 This window display for the Cath Kidston store in Cambridge shows a range of products available in store. They’re displayed simply but creatively in painted packing boxes to increase visual impact. The boxes also emphasise the gift focus of the brand. You don’t need a big budget to make an impact with your window. Use your existing products cleverly and think about colours and shapes – pick a colour scheme for the window to create a unified design and use shape to draw the eye to a focal point. The patisserie window display (see main article image above) in Paris allows people to see into the shop while the colours suggest luxury. The central pyramid of macaroons draws the eye. One easy way of making a visual impact is to group lots of the same product together in the window. Sticking in one of everything you sell will give a jumble-sale effect; instead, draw attention to a key product by repeating it. 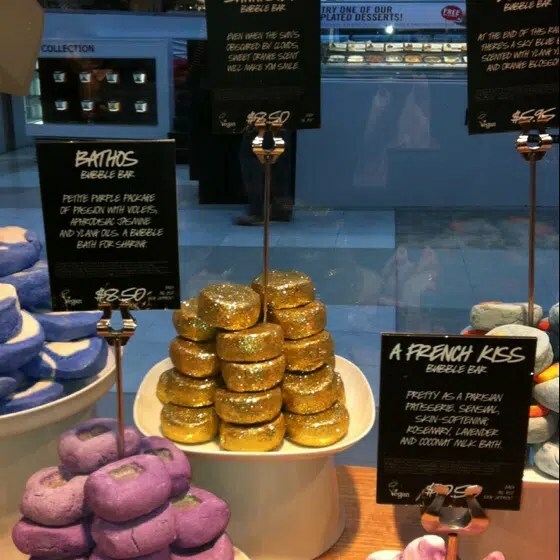 In this window display at cosmetics retailer Lush, bath products are grouped in piles to give colour and shape impact. If your products are small (jewellery, cosmetics, electronics etc.) it can be hard to create an impact even by grouping similar products. Instead, consider using creative display stands to build structure and visual drama. This window display at a cosmetics store uses different sized logs to display small products, also hinting at the natural ingredients used in the range. 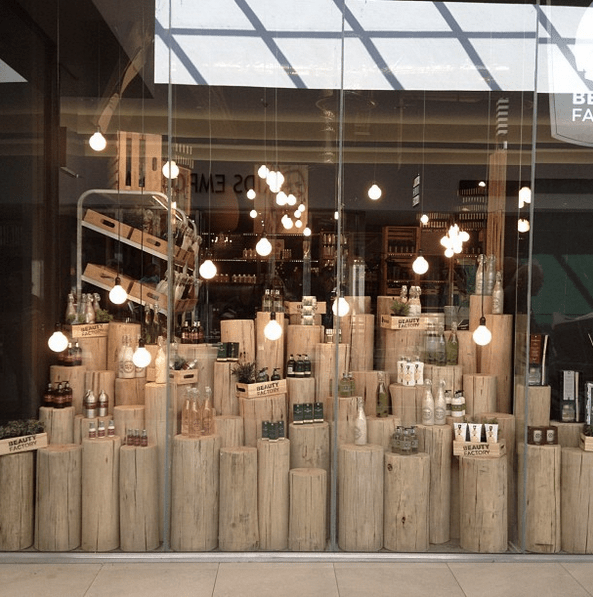 If your business doesn’t have products that lend themselves to an attractive display you can still use window dressing to attract customer attention. Think creatively about how your windows could say something about your brand. 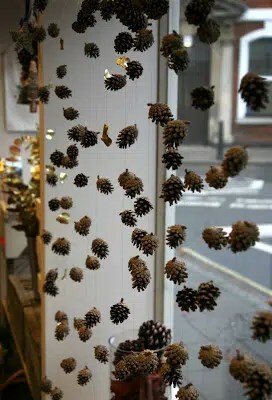 This display at a branch of Hampton’s estate agents was installed to celebrate Chelsea in Bloom 2014. 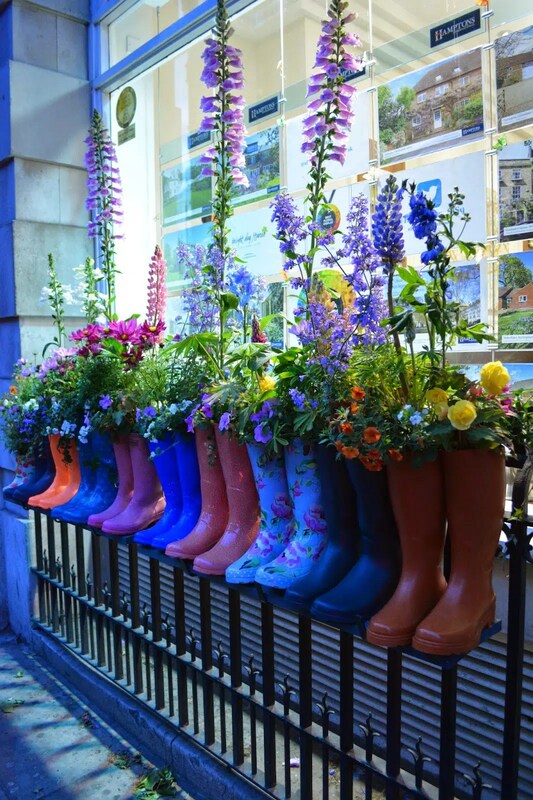 It’s bright, eye-catching, and the combination of wellies and country flowers sends a message about the type of customer the agent is appealing to.